There are many superheroes in this world, but Batman must surely be at or near the top of the list! It’s hard for modern kids to believe that he started life as a comic book character in 1939 and is now the star of numerous blockbuster films. All Batman's TV and film appearances have resulted in the development of hundreds of Batman toys and associated merchandise for kids and adults alike. His outfits and methods of transport have changed to reflect altering fashions, but the toys now on sale are so realistic and detailed that kids can really live out their make believe playtime with more fun than ever before. Batman’s popularity has been sporadic over the decades, but in the 21st century he is now more in demand than ever. In the films he no longer has Robin as his companion, but with his trusty butler Alfred to help him rid Gotham City of his numerous enemies like Joker, Penguin or Two Face, he will endure for a long time to come. 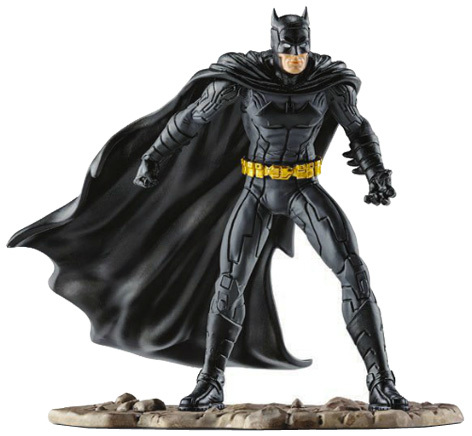 With many other spin-off Batman toys available, he has become a cultural pop icon as well as a commodity to be made and sold. In 2008 Warner Bros. released 'The Dark Knight' which received rave reviews from critics and fans alike who considered it to be the finest Batman film ever. Featuring the late Heath Ledger who portrayed The Joker, excitement was at fever pitch for the third and final film in the trilogy - The Dark Knight Rises. 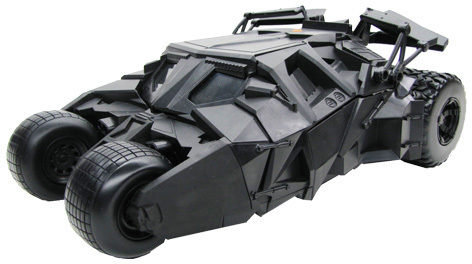 Released in July 2012, this long expected film launched with a great selection of Batman action figures and vehicles that were featured in the movie. Many of these were designed and developed by Thinkway Toys. They included evil arch enemy Bale and the devious Catwoman as well as many other popular characters. In celebration of 75 years of Batman in 2015, Warner Bros. brought together some of the worlds’ greatest toy companies to create some more exciting and iconic products. The Schleich figurine of Batman with his cape flowing behind him is one of our favourites and deserves space on any collector’s shelf. Jakks Pacific created some super-sized 20” and 31” figures, whilst Mattel worked their magic on a range of revised Batman figures and various toy versions of the Batmobile. Their Fisher Price division also created the Imaginext Batcave, one of the biggest playsets they’ve ever made. LEGO were also in on the action with revised building sets and Bandai joined the Batman franchise by releasing some of the best characters in their Spru-Kits ranges. Rubies are well known as the master makers of dressing up costumes, and their expertise led them to create their best ever Batman role-play collection for the smallest kids up to adult sizes. May 2016 has been pencilled in as the probable launch date for yet another Batman movie. This time however he teams up with Man of Steel Superman in a film with the title Batman v Superman: Dawn of Justice. Wonderwoman played by Gal Gadot will also feature in this movie alongside other stars like Henry Cavill and Ben Affleck who are taking the leading roles. The original catalogue shop now sells a huge range of toys at great prices.